By Melissa 7 Comments - The content of this website often contains affiliate links and I may be compensated if you buy through those links (at no cost to you!). 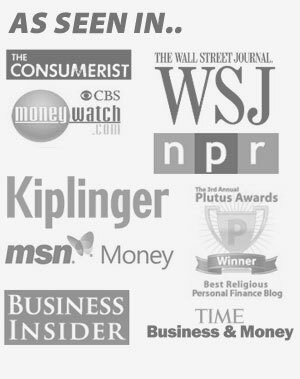 Learn more about how we make money. Last edited February 10, 2014 . Dave Ramsey recommends a small emergency fund of $1,000 so you have enough to cover any small emergency that comes up while the rest of your money is freed up to knock out your debt, ala gazelle intensity. We have 3 small children, and only my husband's income is relatively secure. As a freelancer, my income varies wildly from month to month, so we've decided to have a $3,000 emergency fund. Even though this is more than double what Dave Ramsey recommends while we get out of debt, I still feel nervous. If you're digging out of debt and only have the small $1,000 emergency fund (or worse yet, no emergency fund), there are ways you can add a little extra padding to your emergency fund without taking away from the money you apply to debt. If you're good at using coupons and stockpiling food when you can get it at rock bottom prices, you can have a perpetual full pantry and freezer. If you hit a rough patch financially, rather than dipping into your emergency fund to pay for basics like food, you can temporarily stop buying groceries and live off your stock pile. If you spend $150 a week on groceries for your family, and you don't buy groceries for two weeks, you've just stretched your emergency fund by an additional $300. Chance are you inadvertently belong to several rewards programs. We only have one credit card, but it has a gift card reward program. For every 5,000 points we earn, we can get a $50 gift card. We can use the $50 as a payment on our credit card, as a Visa debit card, or a variety of other ways. Right now we have enough for three $50 Visa debit cards. If we need to cash them out, we won't get them immediately, but they would get to us in 6 to 8 weeks, stretching our emergency fund by another $150. We use Swagbucks to search the internet, and I let the points accrue. Right now I have enough points to cash out for a $75 PayPal deposit. Again, I would have to wait a few weeks to get this money in my account, but free money is free money. Ebates lets you earn cash back when you shop on the Internet. My biggest problem is that I forget to go to Ebates first before making a purchase! Right now I only have $5 here, but if someone was less forgetful than I am, they could easily earn $20 or more in cash back every quarter. Frequent flier miles are something that most people don't think of until they need them. Recently, Kevin at Thousandaire found out that his father was dying. Rather than use money from his emergency fund to pay for the ticket to see his father and say goodbye, he cashed out his frequent flier miles, easily saving $300. If having a small emergency fund of $1,000 or even $3,000 makes you nervous, keep in mind that you probably have much more than you think. Our emergency fund is only $3,000, but if we got desperate, we could cash out our credit card rewards, Swagbucks, and Ebates rewards for a total of $230. Our pantry is also stocked, so we could easily go without grocery shopping, giving us at least another $300. Without significantly changing out lifestyle, our emergency fund is actually $3,530. What sources could you tap if you needed to bulk up your emergency fund? Should some families have a larger emergency fund than others? 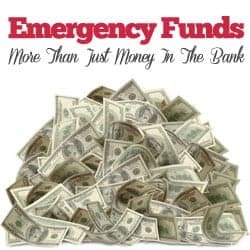 What is the right amount for your family to set aside in an emergency fund? Now that we’re out of non-mortgage debt, we try to keep an even larger emergency fund to cover us in case I were to lose my day job. It should cover us for 8-12 months of expenses. If we were in a pinch, however, we do have a few other places we could go to for quick cash including our Roth IRA contributions (not earnings), Lending Club account for non-invested funds, as well as having quite a bit of stuff around the house that we could sell if we really needed to like TVs, computers and other electronics. I really like your idea about having a freezer/pantry full of food. Even cutting that weekly grocery trip from $100 to $20 for some milk and bread would be a blessing. I also hold on to gift cards (as long as they don’t expire or have a monthly fee). Finally, I prepay some monthly bills. Any extra money I send on student loans automatically pushes the “due date” out. This means I could take a “payment vacation” on those bills if we had an emergency. We definitely stockpile a bit, but not to an intense degree. I really don’t blame the people on extreme couponing who have entire rooms stockpiled with stuff they got for 80%+ off retail price (or even free). If you hit hard times, that stuff can last you quite some time and help avoid grocery shopping. We have a lot of gift cards and I try to keep some money in my paypal account that I can withdraw if needed. I’d never really thought about the rewards programs on my lone credit card. Most of my time with the credit card is spent cursing at it and trying to figure out why I got it in the first place. :) Anyway, those are some very good ideas. I recently did the same as Kevin did with frequent flyer miles when my grandfather passed. I think it saved me at least $500 due to how quickly I had to board a flight for the services. Great tips! I’ve done stockpiling my pantry and freezer for many years. That has been an absolute savings over time and circumstances. In the area I live in, you frequently get snowed in at winter. As well, I have been widowed for many years and don’t like to cook for myself, therefore saving money on having meal size portions ready in minutes versus an expensive meal at a restaurant. My health was very poor for several years and although I could have added the expense of having food delivered, I preferred to prepare my own food when I was feeling reasonably well. I’m sure that this had a lot to deal with my good health now!